-- Today we are in the midst of a global environment quite different than it was 10 years ago, 5 years ago, or even from last year. We also live in a global context that is a dichotomy: one with opportunities offered through technological advancement that help us live our lives better, longer, and differently, but we also live in a world with great insecurity, extreme poverty and many of humankind living in desperate conditions. -- Coming with this dynamic, global context is also a sense of uncertainty as there are more challenges, an uptick in more unintended and intended consequences to geo-political actions, and new state and non-state actors, who see the world not only differently, but have a different playbook, and play by different rules. Many, of which, we do not understand here in the West. -- If you are following the international news today you can see how much the world has changed just this year with the continued surge of the Islamic State (or IS); the massive influx of refugees and migrants into Europe as a result of conflicts in Libya and Syria; the continued tensions in eastern Ukraine; ongoing conflicts in both Iraq and Afghanistan; and what I call the "Sahel extremism belt," running from Tunis-to-Northeastern Nigerian, Mali, and Niger-over to-Kenya, Somalia, and parts of Tanzania. -- Even though we are living in extraordinary times with these extraordinary, daunting world challenges, the U.S. can still make a positive difference. What I mean is despite the challenges in the current global context; the U.S. can have …. and nourish positive relationships. -- Yes, there is a segment of the world population, in some quarters, particular within extremists groups, that see our values and way of life as a negative, or what I believe and have seen first-hand and would describe as "the essence of a clash of civilizations" – were our values, way of life is contrary to their socio-political views and actions Unfortunately in the last few years these differences have manifested themselves into horrible acts of terrorism. -- That being said, the good news is ….. that there are new partners out there, politically, culturally and economically with which the U.S. can further engage for the long term, despite these turbulent times. I would argue that Africa is one of those world regions. -- So let’ start with answering these questions – why is this region important, and what does this region mean for and to the United States of America as a strategic political, economic, investment and cultural partner. In other words: What are the elements of a US-Africa relationship? Overall, these are the basket of demographic elements that require the U.S. to see Africa today as an important Region to engage with properly and to cultivate positive partnerships. --The most significant sub-figure, in the population numbers I just cited, is the figure on youth/young people (ages 10-34), representing about 50 percent (or 600 million people). This figure will continue to grow over the next two decades. I am emphasizing this sub-figure because I see it as Africa's "population dividend." Meaning for me it is a positive (but of course it has the potential to be problematic if certain development sectors are not addressed more). The Continent's population stats will move Africa, in the next decade, from the third most populated region in the world to the largest. But, most of its people could remain below the poverty or extreme poverty level if current development efforts do not triple. -- 75 million – current number of young Africans looking for work now, out of the 1.2 billion working age population world-wide also looking for work; Unemployment is also a world-wide youth issue. -- Africa is one of the new frontiers now for our policies for these important elements of geo-politics, diplomacy, counter-terrorism, emerging markets, and partners in international fora. -- Today we have a range of U.S. programs, strategic partnerships, and educational program, economic and investment relationships laying the foundation for greater and more comprehensive relations. So much so that the President hosted in summer 2014 the first-ever U.S. Africa Summit (never done by any U.S. President, sitting or otherwise), inviting all the African heads of State to the United States for a comprehensive forum to discuss democracy, economic, human rights, and investment issues. He will also hold another business summit with African nations in 2016. -- -- Keep in mind, however, my introductory comments as to the current challenges the U.S. faces with some in this age group in certain parts of the world. Let us not also forget that there are similar sentiments of disenfranchisement right here at home, in the United Kingdom, France, and Australia given some of the terrorist incidences that have happened this year where there has been an attraction to join –even in a "lone wolf capacity" - the Islamic State, Somalia’s Al Shabaab, or Al Qaeda inspired groups like AQIM in North Africa or AQAP in the Arabian Peninsula). --But because our efforts in this regard will also "help" (but will not totally stem) the possible attraction of people in the (10-34) age range to extremist groups, but more importantly it is the right thing to do and in line with U.S. values, and our historical posture of caring about the well-being of people all over the world. -- Rest assured I am not diminishing the need for us to address our own domestic issues of extreme poverty right here at home. (which, includes things from adequate healthcare-to-unemployment-to-education-to-food security and affordable housing, as we should probably have a similar SDG initiative focused just on our domestic poverty challenges. · Remember that there are 1.6 million Africans in the Diaspora here in the United States, who are here because they believe in our values and our system. Thus, these are the "why's" as to Africa's importance to the United State. -- However, I do not believe we need to be constant allies on every single issue, but we need to understand and respect their human cultural differences and their “new global think” enough so that when we do need their allegiance on key international issues, we have a better idea of how to achieve our goal, or handle it, if we don't get their support. We have to keep in mind it is a two-way street --meaning we also need to listen better to Africa's perspectives in times of policy disagreement. U.S. Help on Africa's Development? -- Combating Poverty and Hunger, Improve Health Systems; we have programs such as FEED the Future, Ebola, Pepfar (HIV) and Malaria Initiatives; particularly for at-risk groups such as women, girls, youth, the disabled, and elderly, internal displaced person from conflicts. -- [One of my biggest issues] Expand the number of Small and Medium Size Enterprises (SMEs) as this will help build the Continent’s middle class from its current 90 million, and increase the number of SMEs from the current 331 million. -- We all have heard that there are 280 million SMEs in the US, which help make up our middle class and are the backbone of our society; for Africa that role would be no different. We do some SME, entrepreneurial training, through the President's Entrepreneurial Initiative, African Diaspora Market Place (ADM), Global Development Lab, and some other on-ground programs, but think we need to do more in these areas, and restart providing vocational training. -- We, or any other donor, are not going to be able to provide enough formal jobs for the large number of African youth looking for jobs – remember I said 74 million today, 10 million more young people of working age being added to that figure every year. -- So I believe having a living wage through being an entrepreneur or owning a SME, or having a vocational skill so that one is able to securely provide for one’s self and/or families are key options for more robust U.S. Remember this will be 600 million young people in the 10-34 years age group. --Fundamentally, we must engage differently than we have in the past with foreign partners; we must listen more; understand human cultural differences, and that each country may have its own path to further solidifying its own democracy. The question is how we assist, if asked to help, while also taking care of some of the same issues right here at home. -- I do believe that there are global human values that most people hold dear: they want to be able to feed, clothes and house their families; live with dignity and respect for human rights, and earn a living wage. [have access to adequate health systems and affordable housing; provide education for their children; and earn a living wage through job creation or through entrepreneurial expression. -- They want their governments to also be a voice for the voiceless, support having a free press, demonstrate good governance, and ensure a reduction/elimination of corruption. -- Being treated with dignity and respect in pursuit of the above. (Global Dignity - percepts by Operation Hope: i.e. Every human being has a right to lead a dignified life; fulfill one’s potential and access to a human level of health care, education, income and security. -- As we in the United States lean forward on these challenges I have highlighted, or look out ahead… at the "basket of Africa's demographics" and the "array of today’s geo-political issues," we need to ensure that Africa continues to move up on our list of key places to be fully engaged at all levels. 2. Think about the strategic long term with these emerging African nations, its leaders, and its people, particularly its young people. This also applies locally. As you look at your communities and what long term strategic planning you would/could do? 3. Think in Time – Think in parallel and also strategically about the times in which we live; [What is happening now that is impacting lives, and if that “what” remains the same or changes are there a long term implications. 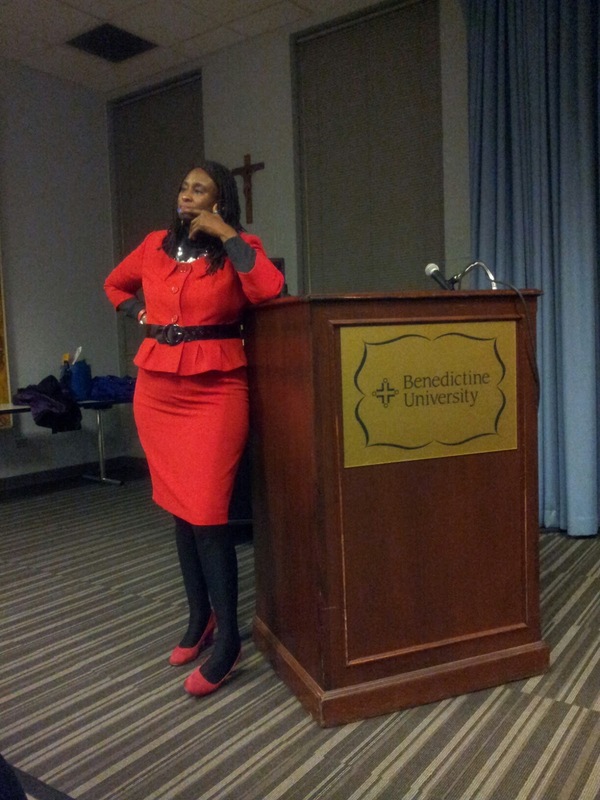 To the Benedictine University students here this evening, I know that your intervening college years here, will provide you with the building blocks to become global, domestic, community or family leaders. I hope in the midst of your time here integrity, fairness, and respect for other cultures are also key “take aways.” I hope that what I have shared with you tonight about global development needs (all applicable domestically) and human dignity expand your thinking about both the world stage and the domestic front, and particularly about why Africa is important to the U.S. It is a complicated, tough global environment we live in today and it is constantly changing. You, as future leaders, will need to understand and try to address these changes without losing the sense of who you are as a person -- if you are working at the domestic community level -- or who we are as a nation if you happen to be on the global stage.